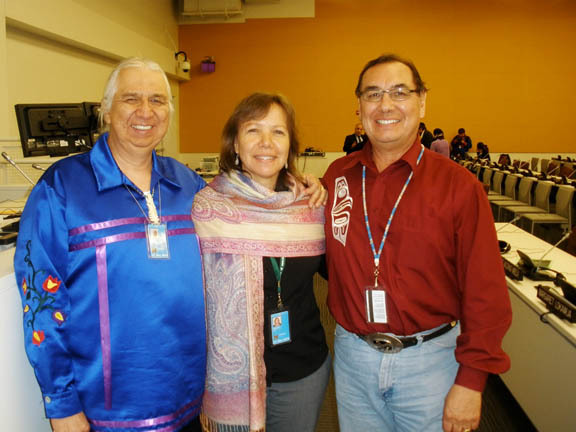 CFSC works with many Indigenous partners and human rights organizations to hold Canada accountable to meet its responsibilities under domestic and international law, including the full implementation of the United Nations Declaration on the Rights of Indigenous Peoples. The Declaration provides a framework for our collective efforts to reset the broken relationship between Canada and Indigenous Peoples. Together with our partners we regularly produce joint statements, open letters, and educational materials related to Indigenous Peoples’ human rights. Below is a description of some of our more detailed pieces of work within Canada in recent years. See also the pages on truth and reconciliation and on the doctrine of discovery. Amnesty International and Canadian Friends Service Committee made formal interventions in the Tsilhqot’in title case to encourage the Court to adopt an approach to Indigenous land rights that would be consistent with international human rights standards, including the United Nations Declaration on the Rights of Indigenous Peoples. In an unanimous decision delivered June 26, 2014, the Supreme Court of Canada recognized the right of the Tsilhqot’in people to own, control and enjoy the benefits of approximately 2,000 square kilometres of land at the heart of their traditional territory in central British Columbia. Read Tsilhqot’in Nation v. British Columbia in plain language. 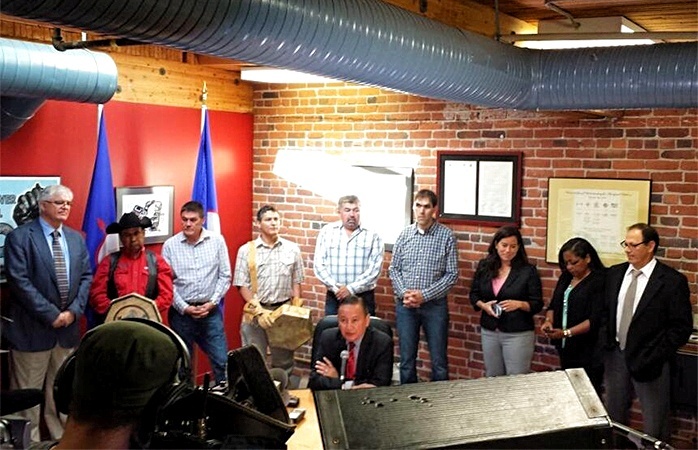 This document explains: Why did the Tsilhqot’in have to go to court? What did the lower courts say before the case reached the Supreme Court of Canada? What did the Supreme Court decide? What are some of the problems with the Supreme Court of Canada decision? Why is the decision important for the Tsilhqot’in People and all Indigenous Peoples? The federal government spends approximately 22% less per child for child welfare services on reserves than provincial counterparts spend in non-Aboriginal communities. A disproportionate number of Indigenous children are taken from their families and placed in foster care. A critical factor is the failure of the federal government to provide adequate funds for the delivery of early intervention and other preventative programs that are generally available to non-Indigenous families. Children’s rights are denied by indifference and legal technicalities. Indigenous Peoples and human rights organizations urge all political leaders in Canada to make a clear public commitment to ending the discriminatory underfunding that is tearing apart First Nations families. With our partners we have made statements calling for an immediate end to discrimination against First Nations families. 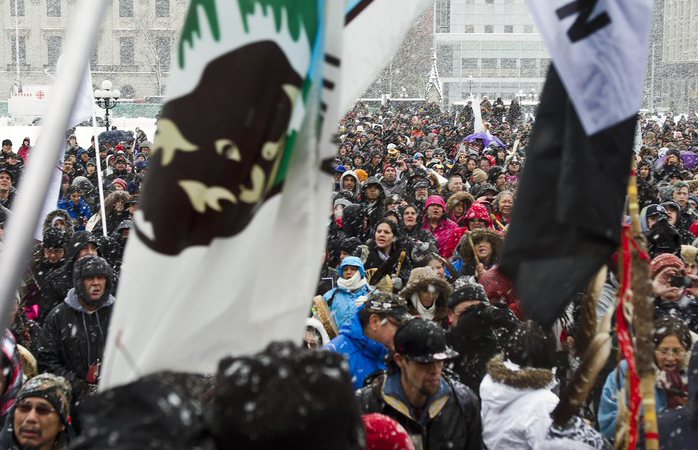 Protesters gathered on Parliament Hill to assert rights and call for a new relationship between Indigenous Peoples and Ottawa. CC-BY Galit Rodan. CFSC is deeply concerned by the impacts of resource development projects on many aspects of Indigenous Peoples’ human rights. We recommend reading this study about particular impacts on Indigenous women and children in remote communities where industrial camps are established. The study looks at what happens in remote Indigenous communities when industrial camps are setup. Findings include increased rates of sexual assault and violence, addictions, sexually transmitted infections, and family violence. The study was initiated by Lake Babine First Nation with the Nak’azdli Whut’en First Nation. The Lubicon have been attempting to negotiate with the federal and provincial (Alberta) governments for more than 60 years. In the late ‘70s, roads were built to access recently discovered oil and gas reserves. More than 400 wells were drilled and the Lubicon subsistence economy vanished as the moose and fur animals upon which they depended fled. 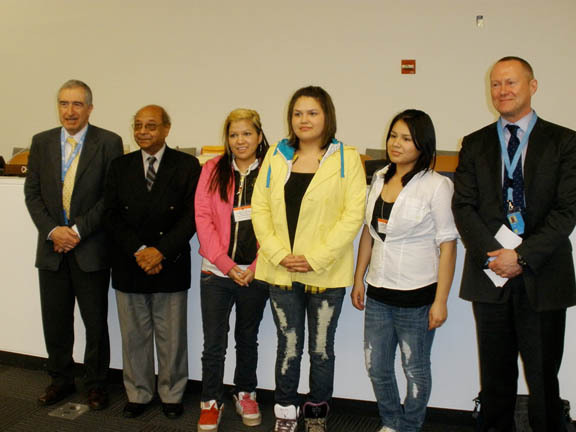 Lubicon Cree youth meet representatives from the UN while in New York to mark the 20th anniversary of the UN speaking out for justice for the Lubicon. In 1990, the UN Human Rights Committee urged Canada to respect the rights of the Lubicon Cree and to reach a just resolution of their land dispute. To mark the anniversary of the historic UN ruling, Amnesty International, the Canadian Friends Service Committee (Quakers), KAIROS, and the Alberta Federation of Labour and the Agriculture Union (PSAC) sponsored a human rights essay contest at the school in the Lubicon community of Little Buffalo. The three contest winners, Leticia Gladue, Daphne Ominayak and Dawn Seeseequon, travelled to the United Nations in New York to meet with the UN Human Rights Committee. An Open Letter to the Government of Canada and the Government of Alberta: A call to uphold United Nations recommendations on the rights of the Lubicon Cree (November 18, 2008). CFSC has been involved in support of the effort for a major revision of the Mining Act of Ontario, in particular so it will explicitly respect the rights of Indigenous Peoples regarding resource extraction plans that may affect them or their territory. CFSC and Amnesty International Canada submitted a brief to the province of Ontario as part of a review of the provincial Mining Act. This was in response to the KI and Ardoch First Nations’ objection to mining on their territories. 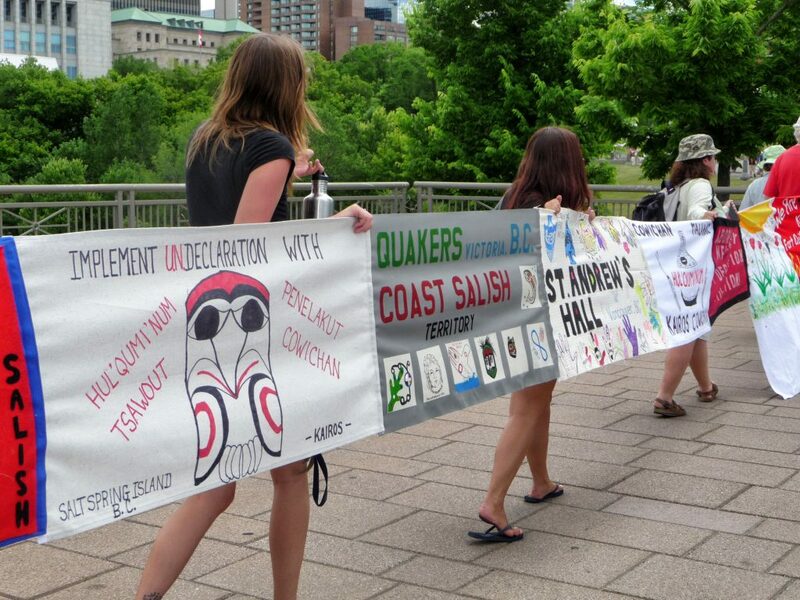 We were also part of a group of 35 signatories representing diverse perspectives and concerns who sent an open letter to the Premier of Ontario in response to the sentencing of Indigenous persons in Ontario for peaceful demonstrations against mining on traditional lands. 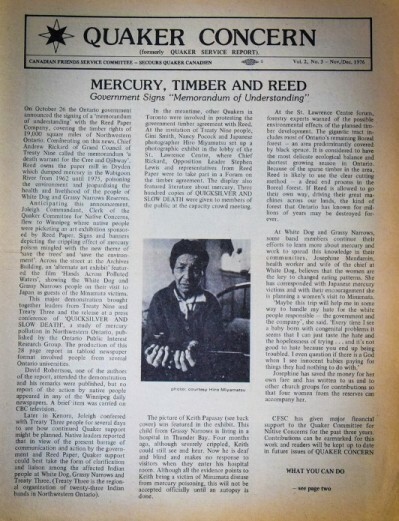 The cover story of our magazine Quaker Concern in 1976 discussed the mercury poisoning at Grassy Narrows. Shockingly, that poisoning continues to this day. Our work on Indigenous issues dates back to 1974, and concerns about mercury poisoning affecting the Ojibway communities of Grassy Narrows and White Dog in Ontario. The Grassy Narrows community continues to protest their on-going mercury poisoning as well as unauthorized development on their traditional territory. CFSC has joined many organizations in urging the Government of Ontario, forestry companies and other corporations to respect international human rights standards that require the Free, Prior and Informed Consent of Indigenous Peoples for decisions that affect their land and resource rights. See for example this joint statement (PDF, 2010) and this one (PDF, 2015). We continue to support Grassy Narrows and White Dog’s long struggle for the basic necessities of life, including clean river systems to fish in. CFSC provides small grants to grassroots projects initiated by Indigenous Peoples or Quakers working with Indigenous Peoples that contribute to the self-empowerment of Indigenous Peoples. Quaker connection is useful, but not required. Grants are a maximum of $1,000. Find out more about CFSC’s grants. Below is an example of one of our project grants. Smoke Signals is a radio program that “aims to educate the public about the worldview of the First Nations cultures of North America.” The show is based in London, Ontario and hosted by Indigenous elders Dan and Mary Lou Smoke. CFSC financially supports this program in its efforts of promoting cultural awareness.